Find Better Ideas, Faster ® with a custom breakup trend report, our PRO Dashboard and 80+ categories of premium trend reports. 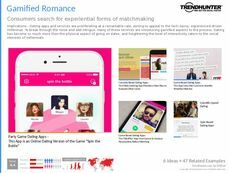 The Breakup Trend Report takes a unique look into the products and online platforms that are being marketed to consumers based emotional associations with relationships ending. The report focuses on mobile apps and outlets that provide emotional relief for consumers experiencing breakups. This report will assist marketing professionals in understanding the demands of consumers who are part of various demographics from Millennials to middle-aged consumers experiencing divorces. Therapists will be able to use this report to better understand the way that consumers are coping with breakups through online services and commodities such as comfort food. It will also be beneficial for retailers and product producers to see what consumers are looking for as a relationship replacement or distraction. Readers of the Breakup Trend Report will be able to explore the existing outlets and products that are being consumed to assist with dealing with a broken heart.